Manufactured From Steel. Adjustable Staple Compensates For Shrinking Or Sagging Of Door. Padlock Lays Straight When Staple Is In The Vertical Position. Safety hasp. Adjustable staple which compensates for shrinking or sagging of the door. Staple is in a vertical position, permitting the padlock to lie flat. When fastened, all screws are concealed and cannot be removed. Screws included. Zinc plated. 3-.50". 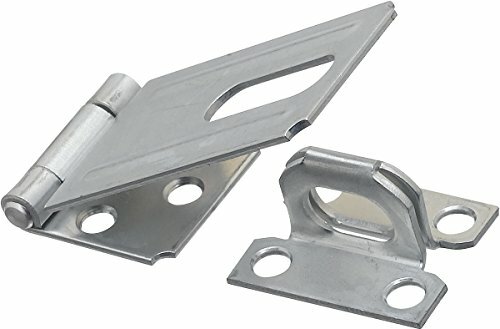 The Stanley Hardware 3-1/2-inch adjustable staple safety hasp is specially designed to compensate for shrinking or sagging of the door. The padlock lays conveniently flat when the staple is in a vertical position. 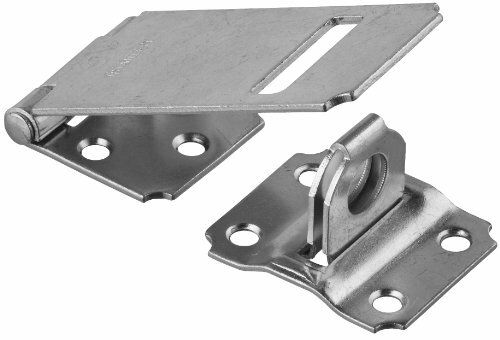 When the hasp is fastened, all screws are concealed and cannot be removed for added safety. This zinc-plated hasp has a leaf length of 3-1/2 inches and a width of 1-1/2 inches and a staple plate measuring 1-13/16 by 1-1/2 inches with a 1-1/16-inch projection; the hasp accepts a padlock shackle up to a 7/16-inch diameter.